The Santa Barbara County Planning Commission took on one of the thorniest issues facing them in reviewing the Initial Draft of the Gaviota Coast Plan: where to site the CA Coastal Trail (CCT). County Long Range Planners Brian Tetley and David Lackie laid out the options facing the commissioners, described as “dueling plans,” with Plan A depicting GavPac proposals for the alignment of the CCT and Plan B reflecting recommendations from county staff. 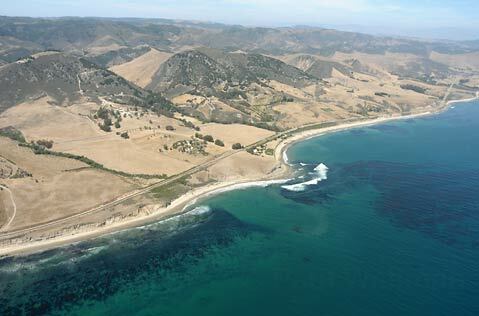 GavPac’s Plan A depicted a coastal route more closely aligned with the freeway in some places and called for the addition of a trails overlay at Dos Pueblos Ranch and along the coastal strand from Refugio to Gaviota State Park. On the other side was county staff’s Plan B recommendation that laid out a more specific alignment for the Coastal Trail, in most cases with routing along the bluff top favored by trails and environmental groups. The trail issues along the Gaviota Coast are particularly difficult. From the Bacara Resort west to El Capitán, a stretch of the coast dominated by a wide coastal plain, vertical bluff tops, private holdings, and Union Pacific Railroad running through it, there is little middle ground. A freeway route minimizes impacts on the private ranches but would leave the Coastal Trail far from the “sights, smells, and sounds of the ocean,” as envisioned by the state when it passed Proposition 20 in 1972. The sharpest comments of the day may have come from superintendent of the Channel Coast District of California State Parks, Rich Rozelle, who objected to staff’s placement of the lines on the map. While many of the issues relating to siting the CCT on the eastern part of the Gaviota Coast through private holdings don’t apply west of El Capitan since State Parks owns a large part of the coastal bluff tops, geography plays a huge role in the options available there. Others supported the staff recommendations. Otis Calef, President of the Santa Barbara Trails Council, noted that “change is coming” in the form of development projects at a number of the private holdings and that the siting of the CCT in the Gaviota Coastal Plan will be critical to where the trail will be located as these projects move ahead. Jim Childress, Chair of the Santa Barbara Group of the Sierra Club, urged the Commission to take in the interests of the broader community rather than just a handful of property owners in locating the CCT. After breaking for lunch, many of those in the planning room speculated about how the Planning Commission would come down on the different plans. The deliberations after lunch began on a more philosophical note with 4th District Commissioner Larry Ferini noting that the narrative was as important as the lines on the map because it sets the tone, reflects what the PRT element is, and shows how it should be used. “There’s an inherent dilemma in working to create a regional trails network while at the same time respecting private property rights,” Ferini noted. In a conciliatory gesture, Commissioner Blough recognized the preference for the trail to be as close to the bluff as feasible but wondered if other concerns might make locations other than the bluff top the preferred route in places. “I’d still like the overlay to go from the high-tide line to the north side of the freeway so we’re sure all of the possibilities are covered,” he added. “I just want to make sure that if we go for a route along the bluff top that it won’t preclude other options if they turn out to be more feasible,” Blough countered, mentioning a number of other issues that could make routes other than the bluff top more preferable. Eventually, discussion of the Recreation policies turned out to take much less time than it appeared it would, leading the Commissioners to turn back to the GavPac and staff trail alignment proposals. Quickly agreeing to approve the north-side trail alignments, they turned to the more sticky issues relating to the CCT siting. “Let’s study both the Staff and GavPac proposals,” Blough countered. Then Assistant Director of Planning and Development Dianne Black chipped in, noting that a project description was needed for the environmental review. “If we adopt the staff proposal for Figure 4-5B, what would the project description be?” Commissioner Cooney asked. “The primary route,” Black responded. With that, the Commissioners agreed to adopt the staff recommendations with some slight revisions, including study of a possible route north of the freeway west of Refugio Beach to the Mariposa Reina overpass. A very long day had finally come to a close. Next up: Land Use issues on July 16 at the Planning Commission Hearing Room with a follow up meeting scheduled for July 30. For more information about the Gaviota Community Plan, go to the Long Range Planning website. Chapters of the Initial Draft can be downloaded there, including the detailed maps for both the GavPac and staff proposals.